Like emeralds dazzling in a turquoise ocean, the Greek Islands number in their thousands, though for a holiday trip, you’ll probably be limited to around twenty. But from the Ionian Sea to the Aegean, sheer cliffs, secret coves and mountain-top villages abound, with each one offering a unique slant on the island experience. It would be hard to find this much variety within the space of two weeks elsewhere and summer deals are making island hopping good value for 2013. Off the west coast, Zante – or Zakynthos in Greek – forms the southern tail of the Ionian Island group, topped by popular Corfu to the North. A contradictory mix of booming coastal resorts and wild inland countryside, it’s possible to have both a noisy beach holiday and a quiet sight-seeing tour of the gasp-inducing scenery around Shipwreck Bay and the traditional tavernas of the north-west. It’s definitely worth a trip up the chain to diminutive Paxos or rocky Lefkada. To the south, and the island-hopper is faced with an enviable choice with the Cyclades Islands boasting the white hillside villages of Serifos and the tempting gastronomy of upmarket Santorini. Out in a sea of its own, Crete merits a longer stay and not just as the largest island of them all: it’s also a minefield of historical ruins, mythical tales and diverse landscape from lagoons to plummeting gorges. Don’t miss the legendary Palace of Knossos, or a taste of the equally legendary spirit, raki. North of Athens, the Aegean Sea is home to the considerable beauty of the Sporades archipelago. Spend a day among the pristine white sands and relative hubbub of Skiathos near the mainland, then head to Skopelos for a completely different experience. The emphasis here is on nature, from glorious botanical displays to plum orchards to spotting the local monk seals out in the bay. Visit the harbour of Hora for a true slice of the island’s character. 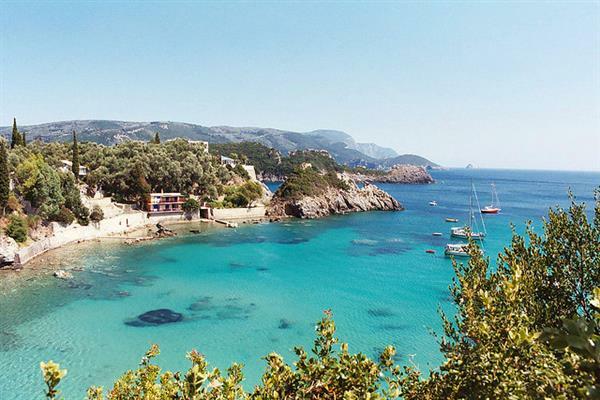 Since many of the larger islands like Zante, Crete and Skiathos have acquired their own airport, it’s easier than ever to find an island-hopping package, with many tour operators currently plugging those early summer specials for 2013. However, frequent ferry services to the smaller islands make it just as easy to escape the tourist crowds in search of culture or just some peace and quiet; holidays that bring together the best of both worlds really are something of a Greek island speciality.